1. If I'm reading this thread right then this aircraft is NZ3056? 2. In regards to that pale colour splashed around the underside of the wings and on the spinner, my first thought is that it could be more of the same NZ Blue Sea Grey as used on the upper surfaces. Am I on the right track? 3. Does anyone know of any copyright issues with this photo? I'd like to colourise and share it but I don't want to step on anyone's toes. To answer question 1) theoretically yes it is NZ3056. I doubt there will be any copyright issue with the photo, as it's over 70 years old, but it depends where you got it from I guess. It's hard to know what that colour is. I would say that it pretty well impossible to say with any certainty just exactly what the colour "splashed around the undersides", etc., could possibly be, but I very much doubt that it would be the RNZAF blue grey colour, which was only ever intended for use as an upper surface camouflage colour. It could be just about anything, even zinc chromate or any other primer colour. Sorry to be the bringer of sad tidings, but asking searching and specific questions about such rough and temporary looking paint applications on WW2 aircraft in operational zones usually only ends in disappointment. Unit histories generally never dwell on such minor discrepancies, so unless the actual painter (with a photographic memory of his youth, 70 years prior) of this aircraft unexpectedly steps forward, I doubt we will ever be any the wiser. Thanks for your replies I didn't have much hope of finding a definitive answer to the question of 'that' colour for the reasons David expressed but it was worth a shot, and anyway it gives me some leeway with what I might colour it; as I think about it some more I suppose it could well be a US paint, perhaps something along the lines of Neutral Grey or Intermediate Blue. Interesting interpretation, i see it as peeled paint. Possibly down to the (zinc chromate?) primer or original base colour. Not uncommon for paint to peel in this way,particularly in the harsh tropical environment. Yes, does seem more likely. 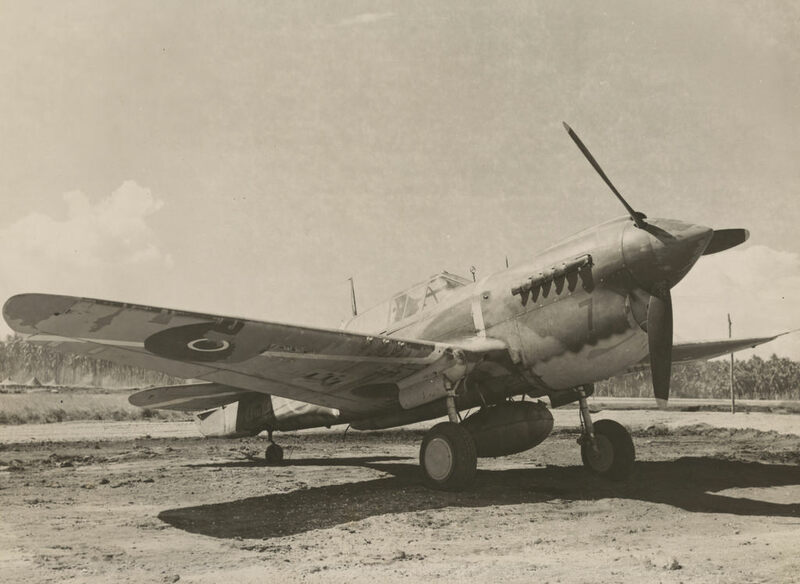 In NZ in the mid-1943 to final quarter of 1943 (a few months after the P-40 photo taken) there was much concern in RNZAF about the poor adhesion of New Zealand-applied paint. BALM NZ sent their chemist to Rukuhia to test several aircraft which had been re-painted recently with NZ-made paints, to check that nothing was wrong with the actual paint itself, and it is hard to feel that right from the start he was suspicious of the competency of the RNZAF spray painters who did this work. It has to be realized that at this time there was no trade of aircraft finisher in the RNZAF, as it seems that painting of aircraft was considered by the powers-that-be that anybody, without any training, should be able to carry out a pretty good job of painting an entire aircraft simply be relying on his natural inborn native skills and a bit on animal cunning. The chemist was right, and he roundly condemned the RNZAF's attitude to this trade, noting that the painters were all in trade of ACH general duties, and were all volunteers, that there were no trade standards at all, and that all the spraying equipment was either completely unsuitable, or incompatible one part with another, that there were no moisture trap, that the air pressures being used were far too high, and each painter more or less trained themselves to the best of their ability. Also procedures laid down were pretty slackly observed, and this was at Rukuhia, the most important aircraft depot in NZ at the time. This chemist then laid down the law as to how aircraft SHOULD be painted, although it was to be many years before the trade of aircraft finisher was finally created (about 1949/50). The type of paint failure being experienced, particularly on Hudsons, was wholesale failure of the new paint to adhere to existing coats, leading to large scale stripping and peeling off into the slipstream, particularly on noses, engine cowlings and leading edges of all flying surfaces. An SBD Dauntless was also studied, with high praise from the chemist as to the factory application of the original paint, in contrast to the poorly adhering locally applied paint. He also conducted some small-scale trials of PROPERLY applied local paint, but the result of these trials seems not to have survived. Hudsons seemed to have been worst affected by wholesale paint stripping off in sheets, with the fact that they often flew through rain being considered the probable cause of this (fighters tended to avoid heavy rain if they could, as visibility would have been so poor that they could not do their job of hunting down enemy aircraft anyway and of course their individual flying hours would be less than Hudsons). I have no idea when the RAF introduced their aircraft painting/finishing trade, but they also relied far more on private industry than was possible for the RNZAF. You can also see why the RNZAF was reluctant to undertake wholesale complete repaints of aircraft under primitive tropical conditions, employing a totally or only slightly unskilled volunteer tradesman as master of ceremonies. Yes that makes a lot more sense that it is paint missing rather than paint of a different colour applied. The S.U.s had paint colours in stock for touch ups and anyone who had free time would grab a brush and a pot and retouch any areas that needed it.Especially the all important roundels. This one was probably about to be retounched. They'd never have slopped blue over the roundels willy nilly. The Safety and Surface trade was created in 1949, David. That's very interesting David and makes a lot of sense, but it does raise a question in regards to this specific aircraft: as I understand it the Dark Earth was painted over (and the national markings of course) while the Dark Green and Sky weren't, yet here it is those last two (factory applied) colours that are flaked... was area flaking of this sort something that would occur even on a properly applied factory paint job given time? I don't know if Curtiss ever had quality control issues in this area. Fuel,solvent spillage,coral dust(ie sandblasting),tropical storm,extremes of temperature(on ground,at altitude),bad day at the paint shop?.might all combine to create a weak spot. Possibly down to the bare alloy,actually that sort of peeling is consistant with a lack of primer etching,underwing is unusual but maybe he was following a larger aircraft on the runway and got an extra dose of dust?. The angle of the pic would suggest the reason for the image is to illustrate the damage.The peeling on the spinner wouldn't be unusual as this gets the brunt of any particles encountered. you are onto it, as I was already preparing to write a "Part 2" to my previous post, on what little we know of that interesting batch of P-40Ks (NZ3045 to 3065) which received the unusual overall paint scheme, although we cannot say that EVERY one of them received the repaint - they could have run out of paint for instance after only so many were finished. Nevertheless, these aircraft showed up in a number of official photographs, including some presumably taken at Hobsonville after application of the new scheme with the blue grey paint, plus others at Norfolk Island, some with the "HQ" codes on fuselage, and still others at Kukum strip, Guadalcanal, now with cowling codes in black (as per the one at head of this thread). All clearly show the unique wavy or scalloped demarcation line between upper and lower surface colours. The Hobsonville shots (if it is Hobsonville, or perhaps Whenuapai) are very clear and were probably taken in the first instance to highlight the new RNZAF colour scheme. These photos seem to indicate that one of the upper surface colours was rather dull in finish, while the other had a certain degree of gloss. My reading of the situation is that the lighter of these colours was the new BALM blue grey, with a very flat finish, and the other colour is therefore presumed to be the remains of the original olive drab, which ironically looks shinier. However this is all purely supposition. The original undersurface colour is presumed to have been USAAF grey (or gray), but the colour in the new RNZAF scheme seems far too light in tone to be this colour, and I have hazarded a guess that this is a new (unknown?) colour applied by the RNZAF, which would make it a prime candidate for peeling off IF the original finish had not been suitably "roughed up" a bit, and thoroughly cleaned of any greasiness prior to application of the new paint -at least that is what I think may have happened. If your photograph is anything to go by, this little experiment was not necessarily a great success. It is also probably a good time to mention that these were the first, and the last aircraft to receive this colour scheme, with all later P-40Ms and P-40Ns being left (at least for the time being) in their original USAAF paint. Many of our P-40s were later partially or wholly repainted, almost certainly mostly in New Zealand for the greater number. I believe that little repainting would be required in the forward area, except in the case of damage to the airframe, whether by enemy action or accident, where their condition would have been pretty scruffy after repair. Any comments on my tentative theories welcome. Sorry for this reply being so late. Thanks for the info but I must confess I'm now more uncertain of the dark upper colour and the lower surface colour than I was before! Given that those two could potentially be anything I think I'll go with the safe option and leave them as Dark Earth and Sky respectively, while I will colour that underlying surface as green zinc chromate (I don't believe it peeled all the way down to the metal as it's too dull compared to those areas on the undercarriage nacelle cap which have worn to the metal). Something I didn't notice even though it was staring me in the face is that the spinner is a dark colour yet I thought Kiwi P-40s had white spinners as part of the theater markings? There is very little doubt that the RNZAF P-40Ks included the blue grey shade in their colour scheme, although the evidence for this is largely circumstantial, and rests on VERY narrow foundations. The blue grey colour was introduced (at least to the RNZAF at large) in March 1943 with publication in Air Department Orders, with an official name and a stores section/reference number (33B/N117 from memory), and specifically stated to be intended to replace the dark earth colour on Kittyhawk and Hudson colour schemes. However it is equally clear that not all RNZAF Hudsons and Kittyhawks (and I am referring only to P-40Es here) had their dark earth colour replaced by the new blue grey shade, but very many did. Robert Montgomery of Blenheim happened to study the fuselage of NZ3043 (owned by THE John Smith I believe) whilst it was parked outside his gate aboard a trailer in the mid-1960s, and confirms that it did indeed have a blue grey coloured paint covering the earth brown sections of the camouflage scheme. On the other hand one Hudson that I know for certain retained its so-called "dark earth" paint to the bitter end was NZ2080, which I personally saw and studied in the 1970s (at least the remains of it, including complete windscreen and much of the forward fuselage, as well as some rear fuselage - the intervening section had been converted into some sort of caravan! David, did any of the home based P-40N's, such as at the OTU's, get painted in the blue-grey/green camouflage? Doh! I just noticed my typo, I said Dark Earth in my previous post when I meant to say Dark Green. Speaking of which, it was my understanding that the scalloped edge between upper and lower surface colours was something some US manufacturers did for a little while when the factory applied paint scheme was for a British order aircraft, and if that's correct I assume the green is (DuPont) Dark Green rather than OD? I'm just typing this out in a hurry as I'm on my lunch break; if I recall correctly, when the Kittyhawks where retired from front line service many received a repaint back in NZ (which you alluded to in your 'pt2' post) with a NZ foliage green upper and a pale blue lower (I'm saying this from what I recall briefly reading some time ago so I could be well off)... so if I am remembering correctly then could that lower surface colour be a viable option for the K in the photo? The question of repainting in-service aircraft in the RNZAF is probably as obscure and poorly recorded as in any other air force in the middle of a major war, perhaps even more poorly. It seems that practically NO interest was taken by Air Department in the esoteric subject of colours schemes as such, but a certain amount of interest is evident with relation to theatre markings and nationality identification from time to time, including the deletion or reduction of the red content of latter. Otherwise they didn't seem to give a hoot, and it was considered as merely a very minor technical matter for technical officers (who already had more than enough to worry about with airframes and engines putting up with tropical operational service without having to ponder on such superficialities as paint colours, no matter how important certain officers within Air Department thought it was). Implementation of changes to colour schemes was something usually left in the hands of the generally untrained (or self-trained) ACH G/Ds who were assigned this type of work, although I guess the engineer officer was obliged to give an opinion when the job was underway, or finished by the airman with the spray-gun. The ACH G/Ds were the ones concerned with implementing any colour scheme or marking changes ordered from above (often, in early days, at request of the (American) theatre commander, although other amendments originated locally within the RNZAF). And another thing; the RNZAF barely had a policy worthy of the name on aircraft markings or camouflage - what passed for policy was mostly an interpretation of existing British standard practice, if the RAF had been kind enough to mail us the latest updates. So we would mainly be relying on the available APs. British practice sometimes tended to confuse us, particularly when they decided to eliminate underwing identification roundels early in the war; despite several requests from Wellington, Air Ministry was unable or unwilling to provide a reason for what seemed an extraordinary and counter productive measure which could only result in confusion among all the defenders, so fortunately was ignored - at least that shows a little bit of local gumption! By late 1943 and into 1944 we also began to adopt certain Americanisms in markings, particularly in relation to the repeating of last digits of serial numbers, but in larger sizes on the fuselages, engine cowling sides or vertical tail surfaces for the benefit of aerodrome control personnel. There never existed a specialised section within RNZAF headquarters with the responsibility of assessing the effectiveness of existing camouflage schemes, etc, presumably because the results of such experiments by very much larger Allied air forces were theoretically available to us anyway, although probably never specifically requested because by this time we probably thought there was no need to re-invent the wheel, and we therefore generally retained the factory-applied camouflage schemes on our operational aircraft, and training types in NZ (as used by EFTS, SFTS, CFS) generally followed RAF or general Commonwealth practice. However Air Department in Wellington was sometimes the last part of the RNZAF to become aware of marking changes in the "forward areas" of the Pacific theatre, when photographs were published in magazines and newspapers, as these were often ordered to be implemented, as noted above, at short notice by American commanders - the RNZAF was, after all, a mere pimple on the massive skin of the Allied Pacific air forces which totally controlled all operational activity. Another interesting "local initiative" which is recorded in colour scheme files (about June 1944 from memory) was one fired by an officer from Air Department who took exception to the varied and poorly maintained colours schemes and markings he saw at Ohakea during a staff visit, considering their general appearance as "disgraceful" and wondered why they couldn't be stripped back to bare metal and be given more uniform markings. He was probably aware that the USAAF was by this time delivering new combat aircraft to the service without any protective camouflage at all, just tactical (including identification) markings. However this suggestion was rebuffed by some "operational" types at Ohakea who maintained that training with realistic camouflage was still justifiable on the basis that visually locating such aircraft in flight and at a distance was a vital skill to be learned by all new fighter pilots, who were initially almost "blind" to them, until trained how to search the sky in a systematic manner; bare metal aircraft tended to draw attention to themselves if any sunshine was about. However the USAAF took no notice of such beliefs, and relied totally on higher performance, hopefully more reliable aircraft, better trained crews, heavier weapons, better tactics, and far greater numbers to overwhelm and finally destroy the shrinking Japanese empire. Gotta say DD that the length and detail of your comprehensive and fascinatingly insightful revelations are apt recommendations of your commitment to research and the motivation that must drive it. May I acknowledge and salute your exhaustive contributions? I know there are others here that feel the same as me. Likewise to the other contributing members cut from the same cloth as you: Thank you, we appreciate it. Hear, hear. We are so lucky to have David here, sharing his amazing depth of knowledge. Looking at the Flying Logbook of Aitken Maxwell Davis, which is held at the Air Force Museum of New Zealand, he joined No. 15 (Fighter) Squadron in October 1942 in Tonga, and there he flew the P-40 coded '7' in Nov and Dec 42 and Jan and Feb 43 several times. When the squadron moved to Nadi, Fiji, in March, he flew '7' numerous times there. In April he ferry '7' from Nadi to Port Villa in New Caledonia, and then onto Espiritu Santo. After a two weeks there he then ferried NZ3056 which he even noted in his logbook as '7' to Cactus. Was this the same '7' or a different one? The adf-serials site indicates NZ3056 was assembled at Hobsonville. I thought all the P-40's at Tonga were ex-USAAF. 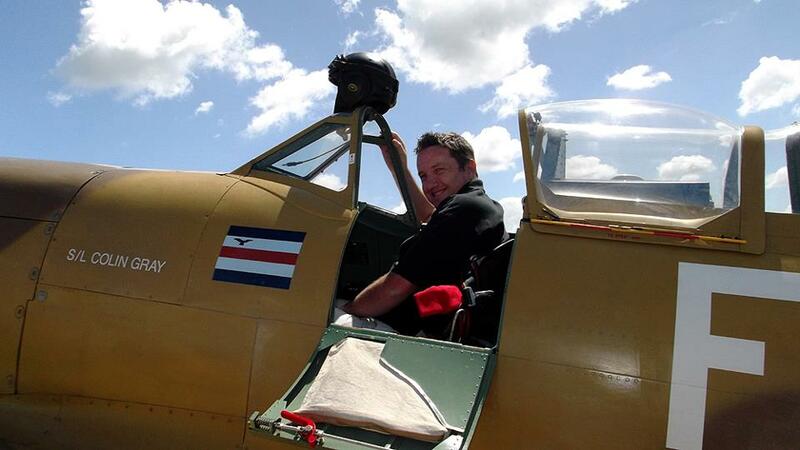 Did some extra P-40's get shipped to Tonga from New Zealand including this one? Or was NZ3056 a different '7' from the one in Tonga and Fiji that Davis took to Santo?